We are moving well along in our series on C.S. Lewis’ The Screwtapee Letters. I have written reviews and will write at least one more. I have asked questions about influences and genre, and looked at Screwtape copycats–including demonic memos by Charles Williams and Dorothy L. Sayers. The highlight of our series covering Lewis’ anti-spirituality is some original research I published (see the “Cosmic Find” here) and some of the consequences that come out of it (see here). Both of those blogs have tremendous footnote conversations. Check them out. All of this Screwtapian work began with a paper I wrote for the C.S. Lewis and the Inklings Colloquium at Taylor University in Indiana. 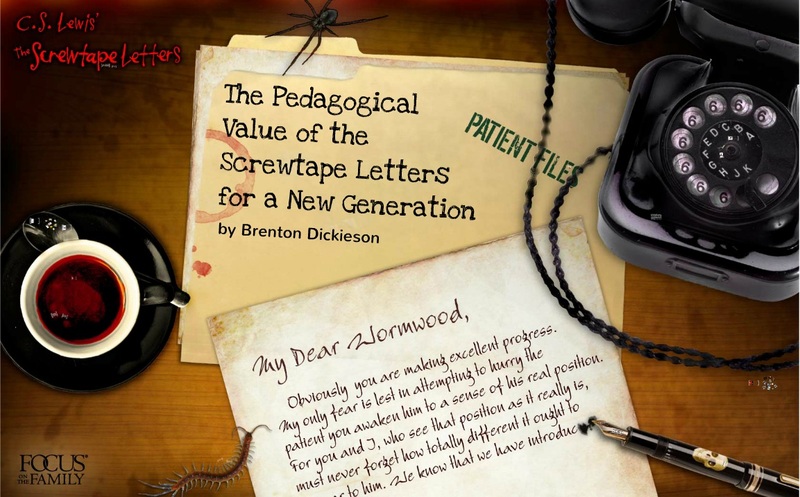 It is priggishly titled,”The Pedagogical Value of The Screwtape Letters for a New Generation.” The paper explores my experience teaching a Christian book, The Screwtape Letters, within a secular undergraduate school. It is quite a lot of fun to explore how students of this generation try to turn their thinking boxes upside down and give advice from a Screwtapian point of view. This experiment in teaching has been published in Inklings Forever VIII, and you can read it for free with no need of access codes or sign in. Just click here. You can see my conclusion at the bottom of this blog. If you have repeated the experiment, or have criticism or comments on the paper, make sure you leave a comment below. Not only is the paper now published in full, but the audio of the lecture is available at the All About Jack podcast. William O’Flaherty, that original Lewis social networker, taped the lecture and has podcasted it so everyone has access. During the talk, I used Prezi to guide the audience through the lecture. You can find the presentation available here if you want to follow along. Simply click here for the audio: http://allaboutjack.podbean.com/e/re-post-teaching-screwtape-to-a-new-generation-brenton-dickieson/. Despite some letters that were weaker in cultural evaluation or in using The Screwtape Letters to form their own Screwtape critique, the inverse (upside-down) perspective was valuable in two key ways. Even at a secular university where a majority of students are non-active or non-religious, the genre of demonic epistolary fiction is helpful for giving space to cultural critique and the content provides inspiration for a creative response to issues in their world. For example, while David Kinnaman is concerned in You Lost Me about a generation addicted to access and consumed with entitlement, the Screwtape genre helps students think critically about their relationship with technology and peer groups. Most of the responses were concerned with the consequences of an action, and not just the action itself. Given the diverse response and the high quality of the letters, it seems that the assignment gives space also for students to develop literary artistry. It is no surprise, then, that demonic epistles have emerged outside of Christian circles, tackling issues of pedagogy, psychotherapy, creativity, and war. There is even a letter of luciferian advice to a junior Palaeolithic archaeologist critiquing a contemporary theme in archaeology (Shea 2011). Evidently, both the genre and message of the The Screwtape Letters continues to be relevant among academics, pastors, and writers, and is demonstrably relevant to thinking students of all backgrounds. This entry was posted in News & Links, Original Research and tagged books, C.S. Lewis, Dorothy L. Sayers, epistolary fiction, literature, Pedagogy, Screwtape, Teaching, The Screwtape Letters, writing. Bookmark the permalink. Thanks for giving us access to your paper on your experience teaching The Screwtape Letters within a secular undergraduate school!